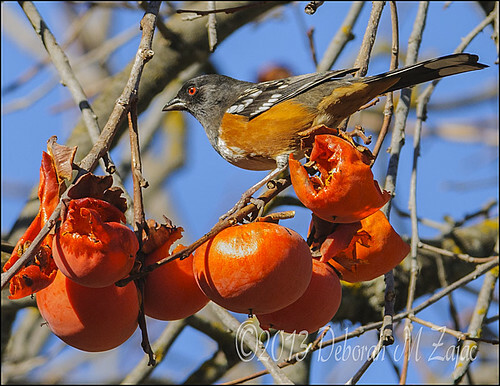 Spotted Towhee, originally uploaded by CircadianReflections Photography. Copyright Â© 2013 Deborah M. Zajac. All Rights Reserved. I had some free time today so I met up with my friend Dali and we went birding. It was a great morning for birding. We saw this Spotted Towhee, Nuttal Woodpecker, Sparrows, Chickadee, Blue Jay, a Wrentit, and a couple of photographers who were there before us said we missed a California Thrasher by seconds. The Red Bellied Sapsucker that has been visiting this Persimmon tree didn’t show up in the 2 hours we were there unfortunately. Previous Previous post: The Stockings were hung by the Chimney with care.